and service to Him and to others. led or hosted by staff and volunteers. even as they help others to do likewise. with God together with us! It is directed by Father Len and Hallie Cowan, is overseen by a Board of Directors, and is supported by partners who believe in its ministry and by a community that lives by a Way of Life focused on virtues for living. It is in partnership with the Anglican Diocese in New England. Len and Hallie met at a church renewal weekend while in college, and have been pursuing and promoting a deeper life in Christ ever since. Len served as an Episcopal priest for 37 years in three parishes, a summer camp, and diocesan and regional renewal ministries. Hallie served with InterVarsity Christian Fellowship for 28 years, first as campus staff at three women’s colleges, then as Coordinator for Prayer and Spiritual Formation for staff in New England. 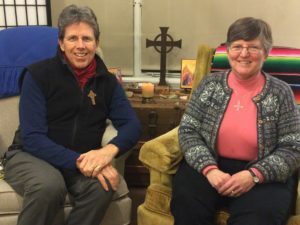 While serving in their last parish, Len and Hallie developed and co-directed The Refuge, a center for renewal, retreat, and refreshment at the church building. Len stepped down from parish ministry in 2015 to develop The Abbey of the Way, located at his childhood home in Worcester and repurposed as a center for prayer and spiritual formation for Christian leaders, where he and Hallie now live. The Abbey is grounded in a life of prayer and service kept by Len and Hallie, and promotes a Way of Life based on Christian virtues, activated by the Holy Spirit in response to spiritual disciplines. The Cowans are experienced Spiritual Directors, and are actively involved in promoting prayer in various Kingdom-focused networks of believers in Worcester and New England. In January of 2017, Len asked to be released from his orders in the Episcopal Church, and is now pursuing priestly ministry in the Anglican Church in North America by assisting the Bishop of New England in fostering intercession. Though Len and Hallie are now officially Anglican, they fellowship with the breadth of the church, embracing the evangelical, charismatic, catholic, and justice streams of renewal which advance the Kingdom of God. They are part of The Journey, an independent church start in Worcester. Len and Hallie are blessed with two grown daughters who share their life in Christ, and two grandchildren. Who can be a part of the Abbey and its ministry? Though the Abbey’s particular focus is for building up Christian leaders, anyone is welcome to find refuge here. How do I register to receive more information? or sign-up for our e-mail list by clicking HERE.